Oh me oh my, yummy delish. 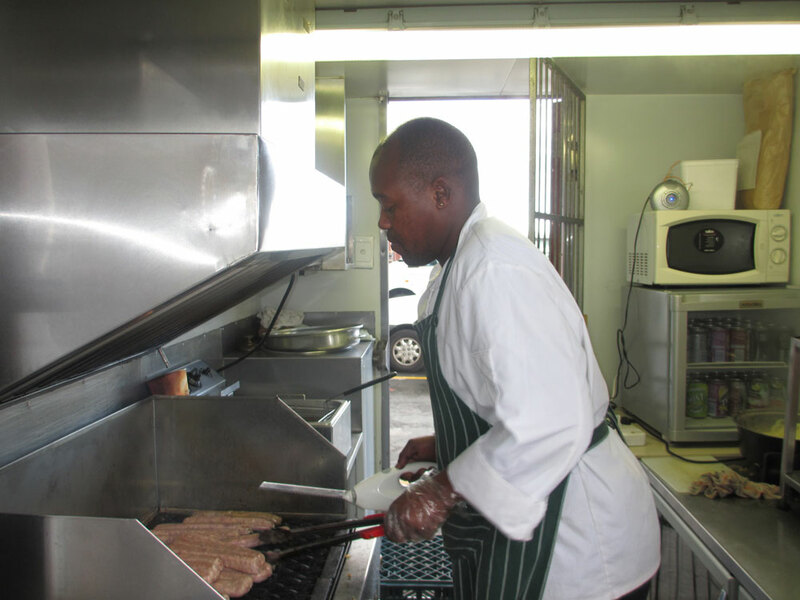 There is only one spot to get a boerie roll and I bet you’ll never guess where! From no other place than outside the Builders Warehouse in Tokai. This morning I went on a series mission to find bathroom accessories (I am planning on renovating the bathroom in my flat – I only have a bath and a toilet from basically when they were invented). So off KleeB, the Wam and I went to Paarden Eiland to mission through the various bathroom and tile spots. On Tap was our first spot and after a cup of free hot choc and jumping into the baths on display to get a feel we headed on to the strip that housed Malls Tiles and a variety of other spots. After purchasing a sample tile from Tiletoria and then missioning back to Malls to see what it looked with one there. What a winner – i’m pretty stoked because all the elements of this bathroom were coming together. Oh I must mention that just at the entrance of Malls there is a dude selling some samoosas that are epic – and you might even get a plastic rose for your troubles, who says you can’t be wined and dined on a Saturday morning! But we decided that we needed to make one more stop at Bathroom Bizarre. You know the place with the awful jingle, “B-I-Z-A-R-R-EEEEEE come to Bathroom Bizarre, come to Bathroom Bizarre”?! The only one close enough is in Tokai in the place where Builders Warehouse is. 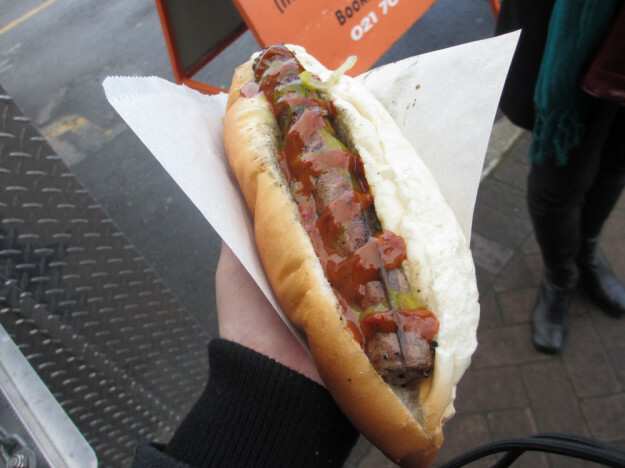 We parked opposite the shop and as we got out were hit with the most yummy delish of boerewors and we were sold! After a quick squiz (and a jump in a bath to get the feel) we were super lazy and drove over the lot right outside the boerie stand. A fresh batch of boerie had just been slapped on the grill so it was a wait for a few minutes before we got ours. Of course we went for the ones with onions, which were piled high and an extra long juicy piece of boerie on top. I topped mine with some mustard and a sort of tomato, curry, chilli sauce. Sheesh were those boerie rolls devoured in a few minutes. What a find, I’ll be back for more of those. Do yourself a favour and make a mission down there – you won’t be sorry! This is the rad boerie roll guy – who uses a carving knife to slice the rolls and separate the boerie – it’s a show in itself! This entry was posted in Eat and tagged best in cape town, boerie, food, lunch.